Secret Admirer is a simple cabled scarf - with a hidden message. It uses binary numbers to encode a message that is invisible to the casual observer. 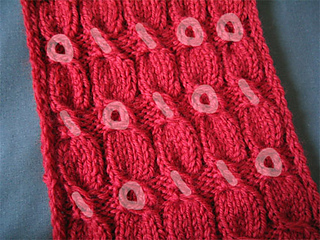 Small cables shaped like the numbers 0 and 1 allow the scarf to be “read” - but only if you know what you’re looking for. Encode “I love you” for your sweetie or your seeecret crush, or encode anything you want; instructions for the entire alphabet are given. Difficulty level: easy, suitable for an advanced beginner. There’s only one kind of cable and you can even do your cabling without a needle. Encoding the numbers is as simple as anything - just one row of each 12-row cable repeat takes care of the encoding. This scarf would be fine for a first cabling project.